The eggplant is not one of my favorite vegetables. I rarely buy one and when I do, I end up making the one dish I am most familiar with- baingan bharta. I recently bought home a few baby eggplants with the intention of trying out something else for a change. As always, I looked toward Taste of India for some much needed inspiration and it came to me in the form of these two wonderful pitlai recipes. 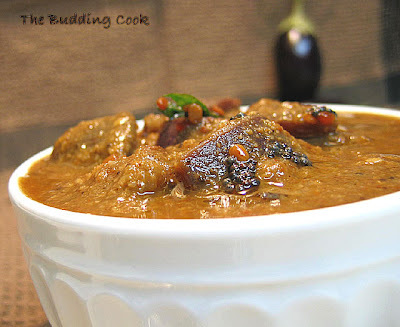 Pitlai, I understand, is a very popular preparation in the Tamil Brahmin community. This is how I made it. 6-7 brinjals, cubed and placed in a bowl of salted water to prevent discoloration. Cook the eggplant cubes with some salt in the tamarind extract. Add the jaggery. Cook till eggplants are soft. Add the roasted and ground spice mixture to the cooked eggplants and cook on medium heat for 2-4 minutes. Add the cooked dal to the above mixture. Add desired amounts of water depending on the consistency required. Cook for 5 minutes or so. Bring to a boil and turn off the heat. In a small pan, heat the oil and add all the ingredients for seasoning. Pour the seasoned oil over the pitla. Serve hot with some rice and appalams. This is the first time I have used eggplants in this manner and I can’t say that I was too disappointed. It tasted really good! This is my entry for Abby's Vegetables, beautiful vegetables. On another note, Court Cooks considers me worthy of this. Anjali has passed this onto me. Thank you for thinking of me! I really appreciate the friendly gesture, Court Cooks and Anjali. Oh,,this curry looks awesome, mouthwatering. Congratulations for ur well deserve award!!!! I bought some eggplants today because they were striped and light purple, not seen in a long time. Maybe I'll make this. Lovely recipe. Bookmarked it gonna try this soon. As you said I am also familiar only with baigan-bartha I've been surfing lot of brinjal recipes recently I think I got one here. Recipe is really very Nice. I enjoy your blog so much. Virtually every single recipe you post I want to try. I'm not a big fan of eggplant either, but I just know I would like this. Thanks! the gravy looks so good, tbc! i guess will go well w/ other veg as well? Sowmya- your recipe was my inspiration. Rajitha- I will try that next then. I think I saw a recipe on Indira's blog. Shriya- yeah, it used to be baingan bharta all the time! I could not think of anyhting else. You're cooking a lot from other blogs, aren't you! Lisa- awww, what a nice thing to say! Richa- thanks! I would definitely try this with veggies that I like more the next time. I have a feeling that I'm gonna make it with pineapple next. It would be hot and sweet...yummy! Am not a big eggplant fan, but it seems to be on everyone's favourite list! Mouthwatering dish.. would try this soon !! Deeeeeeliiiiciiious TBC :o) You keep outdoing yourself on every recipe. Do you mind being a guest blogger?? That is a fantasic and tantalizing photograph! Cris- U mean kathrikai? or brinjal? Anuzi- you are very kind.;-)Thanks! Shravan- welcome to my blog. Looks gorgeous! An absolutely new way for me to cook eggplant. Would love to try it! thanks TBC, thanks for ur nice comments. i usually make only eggplant bharta. this one is a nice change. so whr did u do ure food science from? Pitla looks yum.. that bowl looks so gorgeous & wish i could grab it for todays lunch :-) As usual great photo TBC!! Congrats on 2 awards for you deserve it! Hope your sis is reading your posts & trying it out too !! Your curry looks so delicious! Simply mouthwatering! Love your pictures TBC... I know i've missed a lot of posts but the pics of the tomatillo and the stack of pancakes - absolutely brilliant. I like pitlais but haven't tried with eggplant.. will keep it in mind. I seriously love eggplants and don't cook them enough. You have inspired me with this recipe. I looks wonderful. Private chef- thanks for adding my blog to your comprehensive list. Compiling everything must be so much work! Thanks for the hard work all of you put in. It is so nice to see your comment. I've missed you! Thank you. I hope u are enjoying day2 of your vacation. thanks for sharing with vegetables, beautiful vegetables! me now doing trtmnt for the old problems..
not much change yet, will write u detail later..
how are u, I like all your recent recipes and pics, looks beautiful.. Tried this recipe too Budding Cook.Read about it on my blog :)It was a hit.Thanks again. You made another one from here so soon? Thank you. :D I'll be over to check out your space.